Of course it is easy to make fun of all the Star Trek and Star Wars nerds, and did I not some days ago see another film (Fanboys) that played that tune? This one is much better, of course, mainly because it has Alan Rickman’s pain-stricken face and Sigourney Weaver’s cleavage in it. 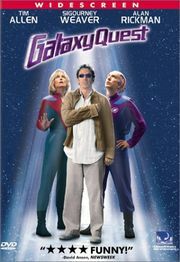 They are part of a team of Star Trek-alike actors who suffer from being reduced to opening fan conventions and electronics markets, but they are rescued by some real aliens who think the Galaxy Quest show they watched from out there was a documentary. So together they fight against some green things that look like fat versions of Jim Carey’s Grinch, and wreak some intergalactic havoc. Weaver’s zipper goes further and further down, and the earthly star trek … sorry, Galaxy Quest geeks at last get their chance to save the galaxy. Mostly harmless fun! It took me a while to get into the humour of this one but it does get even better with subsequent viewing. Some great performances and a really good script. that’s good news, I am looking forward to seeing it again! I can actually imagine that it’s one of these films that makes for nice frequent Sunday afternoon entertainment.